One of the news items, in fact, it was reeled as a Breaking News item, last weekend was the Ceasefire Deal that was entered into by the FGN with Boko Haram. I am sure so many of us will say it is a welcome development; but immediately I saw that piece on Channels TV I knew this is another of those displays of mental incapacity to think right and to act right by the crop of managers in charge of our state affairs. I am sure many of us must have been reading different analyses and commentaries on why this particular ceasefire is defective. I have my wholesome reservations too about the deal but I will only employ Maieutics to drive home my point. No one is trying to ridicule the efforts being made by the government to restore peace and orderliness in the land but when the same government does not act with sincerity of purpose then one isn’t left with any other option than to express one’s doubt. For those that will say I am being paid for this apologue, I will try to answer you in this manner, Yes, I am a progressive but not at all a party to Aggrieved People’s Consortium neither am I a game player amongst the Progress Destructive People. I believe you will employ strict ingenuity in reading this piece. Ceasefire or armistice as I understand it by the teachings in my Public and International Affairs Master’s programme, is a truce agreed to between opponents so they can discuss peace terms. But remember, the FG on many occasions has come out to announce that everything is normal. The salacious man that was employed as a ravelin to the handler of information from Aso Rock had, in fact, in his usual impaired intelligence, queried peoples’ analyses of the State Of The Nation to the end that the country is at war. Why did it take you, the FGN so many months before this purported peace brokerage, even when it was obvious that that is the first option in ‘procuring’ peace, rather than ammunition? The lame explanation is that “government doesn’t negotiate with terrorists”. But would anyone in this government feign deaf or blind when few months ago ‘the almighty’ USA exchanged five deadly terrorist cell leaders for the life of just one of their citizens? Just few days ago, we were told that Shekau, the mad dog leader of Boko Haram was killed. When people raised doubts as usual, the government in her usual manner intimidated the public and asked that evidence of his being alive be provided. In short, the FG was beating its chest that Shekau has been mauled in one of those heavy bombings of the sect’s hideouts. 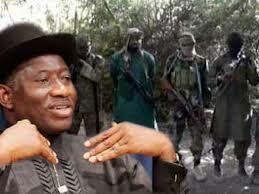 But the same government made a submission that Shekau agreed to the armistice. I wonder when the dead started agreeing to the deals of the living. When they announced that he had been killed I said to myself, ‘it is a matter of time’. Here we are. Would the ceasefire deal entered into with Boko Haram by the FGN include the restoration of the dignity of those innocent girls and women who were raped and or kidnapped from their homes and schools, or the lives of harmless and ‘armless’ people that were killed in cold blood, on a daily basis by these religious rapists? Would it include restoring the cattle that were stolen or burnt and the farmlands and homes of agrarian communities that were destroyed? Why is the ceasefire coming in the wake of few months to the General elections? I am sure some of us will say the timing isn’t of importance since it has happened all the same. Very good point. But I will like people to understand that if there is no peace in the land, the chance of this government’s continued stay in office is slim; and when is a better time to score political points other than now? Thus we may have to call the sincerity behind the move to question. Why the sudden jerk to responsibility just at the wake of a promise to restore the nation’s integrity and security by a Presidential candidate of the opposition if elected? Why go to South Africa to disgrace us in the bid to procure ammunition through the ‘back door’ if you had this ‘armistice deal’ ongoing: because I know the discussion precluded the ‘arm procurement’ saga? If the CDS could order his men to stand down, does he know that less than 24hrs after his announcement, these animals still perpetrated their nefariousness by ravaging some towns in Adamawa state and in about 72hrs to that, some women were also abducted? Just yesterday, Azare town in Bauchi was visited by a carnage that consumed about 5 lives. This same CDS told us he knew where those girls are being kept. I have many questions on my mind but I know if only they could answer these few ones, you will see some form of culpability in this mess. In all, I share the pains of the abducted girls as well as their parents, likewise the pains of those that have lost their loved ones in one way or the other to this ravaging insurgence in the land. I grieve for the families of the members of our armed forces that have paid and continue to pay the ultimate price in this ongoing onslaught by the insurgents. In this wise, I join the members of the public again to ask that this government be responsible enough to act right. Wonder when these old crop will leave the centre stage to allow young bloods take the reins. The other day, a man that is in his seventies, picked a nomination form at his party secretariat to campaign for the post of President. He was flanked on all sides by young men and women that I believe should be expressing their intent to turn this land of ours around, rather than being escorts.